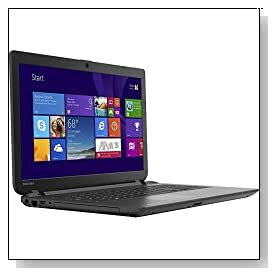 Toshiba Satellite C55-B5300 is a light duty low cost 15.6 inch laptop with an Intel Celeron N2840 processor at up to 2.58GHz speed, good amounts of memory and storage, an optical drive, a faster USB 3.0 port- entry level but overall adequate features and power for everyday home entertainment such as web browsing, playing videos and songs, working on Word and spreadsheets but not really for heavy gaming. Toshiba Satellite is offered with the dual core Intel Celeron N2840 processor (1MB cache) at 2.16 speed up to 2.58 GHz speed with turbo function but no hyper threading, 4GB DDR3L SDRAM memory (CPU supports up to 8GB max memory), 500GB Serial ATA hard drive at 5400 rpm rotating speed- fast read and write times and good amount of storage and 64-bit Windows 8.1operating system. N2840 performs better overall than Celeron 1037U and the previous Intel Atoms and is sufficient for everyday web and office tasks (having 4GB memory also helps) and is an ultra low voltage processor with a Thermal Design Power of 7.5 watts, which is good for battery performance. 15.6 inch LED-backlit TFT high-definition widescreen display with Trubrite technology and 1366 x 768 pixel max screen resolution (native support for 720p content) means crisp, sharp and vibrant images with fine details but not like a Full HD or Retina screen and there is no IPS (something you can’t really expect at this low price level). You can play movies comfortably but expect to use up to half of the Celeron CPU power and opening other programs may cause lags. Sound quality is not super impressive because of the small speakers, so sound is not this computer’s strong point but it is all right. It has a basic HD webcam with microphone that is good for smooth running of Skype. Graphics card is the Intel HD Bay Trail which could let you play older games like World of Warcraft at lower settings but not majority of the latest games- neither the CPU nor the integrated GPU would be adequate for that. 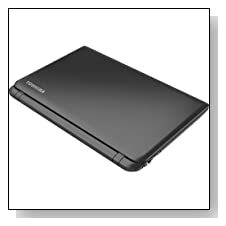 Textured-resin finish in jet black stylish Toshiba Satellite weighs 4.9 pounds with measurements of 10.20 x 15 x 1.10 inches for convenient portability. It comes with a non-backlit comfortable to type on standard keyboard with a 10 key numpad to easily enter numeric data. Battery life is reported to be around 4 hours in average use from its 4-cell battery. There is no Bluetooth mentioned in reviews but a Multiformat DVD±RW/CD-RW drive with double-layer support, WLAN 802.11b/g/n wireless, 10/100 Gigabit Ethernet LAN with RJ-45 connector for easy wired connection, a USB 3.0 port for fast data and multimedia transfer and 2 USB 2.0 ports, a socket for headset/microphone, a Multiformat media reader that supports SD, SDHC, SDXC, miniSD, microSD and MultiMediaCard formats and an HDMI port to connect to HD displays or to a HDTV. Conclusion: Toshiba Satellite C55-B5300 is a good entry level PC with a low price tag and gives us the impression that you would be getting your money’s worth if you will be using it for entry level tasks on a daily basis- cheaper than even many high-end tablets. It comes with a 30 day trial version of Microsoft Office 365 and useful software like Adobe Reader installed. When you first buy it, you may want to uninstall some of the bloatware that comes pre-installed on it to get better and faster performance. Screen quality is good for what you’re paying, sound is OK but not amazing, battery life is adequate for daily use, processor can handle many daily things just fine but not very demanding advanced software or games, Windows 8.1 is better than the previous Windows 8 but many people still prefer the older Windows 7.. Toshiba is a good brand as you would be aware and this is a basic machine for simple day-to-day stuff so it will come down to your budget, preferences and what you will use the computer for.